A health insurance claim is when you request reimbursement or direct payment for medical services obtained. The way to obtain benefits or payment is by submitting a health insurance claim via a form or request. There are two ways to submit your health insurance claim. What Are the Options to File a Health Insurance Claim? The first way and the most convenient is when your medical services provider can submit the claim directly to the insurance company through the network electronically. The other way is by filling in the health insurance claim form and sending in the paperwork yourself. If your health service provider is not in the network for your health insurance company and can not file the claim on your behalf, then you will have to file a health insurance claim form to request payment for the medical services obtained. Sometimes you may have coverage under your own health insurance plan, and your spouse's. If this is the case you may be able to get more compensation by using the two plans and filing two claims. Learn more about coordination of benefits and multiple health insurance policies here. You used to have to submit health insurance claims through the mail, but with advances in technology health insurance companies and medical benefit plans now offer a few different options, depending on the health insurance company. When you go to the doctor or other medical provider and are told that you have to submit your own insurance claim form, it means that the doctor or facility does not ask the health insurance company to pay for your bill and you must do it yourself. 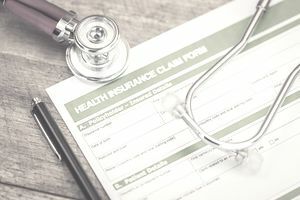 If you have to file your own health insurance claim here are the steps you will need to take along with some helpful tips on submitting your insurance claim form. In order to complete the steps, you will need to understand your medical bill. You will also need to have some basic information to fill the form out. what was the visit for (accident, workers compensation), etc.? You will need to ask your doctor for an itemized bill. An itemized bill lists every service that your doctor provided and gives the cost of each of the services. Make sure any medications or drugs provided during any treatment are clearly listed with itemized costs. Your health insurance company will need you to attach the original itemized bills to the claim form. You will need to contact your insurance company to obtain a health insurance claim form or download a copy from their website. Your claim form will also give you additional instructions pertaining to what other information they may need from your doctor or healthcare facility. Once you have your claim form filled out and your itemized bills from your doctor, don't forget to make copies of everything. It will eliminate any errors that may be made in the claim process and make it easier for you to re-file your health insurance claim if it gets lost. You may also want to check the billing codes for medical errors and contact your health provider if you need clarification. This will avoid having your health insurance denied for incorrect information. Learn more about health insurance claim denials and what to do about it here. To make sure everything is completely accurate, call your health insurance company and tell them you are about to send in your health insurance claim form. Review with them all the paperwork you have and ask them if there is anything else you need. Also, ask your insurance company how long should you expect to wait for your claim to be paid and mark that date on your calendar. Once you have everything in order, send out the claim form to your insurance company. The address to send the claim form should be on the claim form itself. Keep an eye out on your calendar for the claim date that you marked and contact your insurance company if you don't receive your claim within the time frame given to you. Before you start filling in paperwork and heading to the post office, always check your health insurance company's website. Many insurance companies now offer the possibility to log onto your health, and medical benefits plan online. You can ask your employer if your health plan offers this option, or if your healthcare plan is not through your employer, contact your health plan insurer directly to find out if they have access to their services online. Usually, if you go to your insurance company website, there will be a place where you can log on. If you do not have the information call them and have them help you set it up. You may also be able to fill information online and submit at least part of the claim via your health insurance company website. If they do not offer full online submission, you may be able to start the claim and just mail in the supplementary documents with the associated reference number. The benefit to submitting claims online is that the payment for your claim may be significantly faster, in some cases 24 hours. Getting your payment processed as fast as possible is worth going through the trouble of setting up an account to manage your services online. There is also a good chance that when you fill in your form online, you will also immediately see what portion of the claim is covered, what your co-insurance clause is and what deductible, if any, applies. Setting up an account to access your health insurance benefits and claims online will help you be better prepared to understand the related health insurance out-of-pocket expenses, or what kind of refund or payment your benefits plan will pay. In some cases, a health insurance provider may not offer online submission or may limit online forms to specific services. In those cases you may have to print a health insurance claim form and fill in the details, then submit it via the mail.